This article is about the game, Metroid Prime. For other uses, see Metroid Prime (disambiguation). 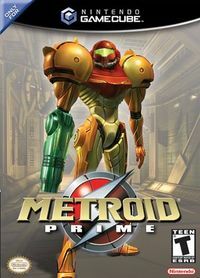 Metroid Prime (メトロイドプライム, Metoroido Puraimu) is the first game in the Metroid Prime series, released for the Nintendo GameCube in November 17, 2002. Metroid Prime is the first game in the series in 3D and the first Metroid game released in eight years after Super Metroid. The game was developed by the Nintendo-owned Retro Studios and published by Nintendo. One of the significant new features that the game had, was the use a first-person perspective instead of traditional side-scrolling action. Despite the new perspective, the many differences in gameplay that Metroid Prime had compared to other first-person shooters made Nintendo officially classify the game as a first-person adventure. Metroid Prime was first announced on E3 2001. It was later revealed that the game was meant to be played in a first-person perspective instead of a third-person point of view. This news was met with a cold reception from the fans who thought that it was a disgraceful transition to 3D. In addition to that, due to frequent layoffs and corporate reorganization at Retro Studios during development, the game was believed to be a failure throughout gaming related message boards, publications, and magazines. When it was released, Metroid Prime was critically acclaimed and became a commercial success, selling over a million copies on American alone. A remake was done for the Wii with updated controls and improved graphics, released in Japan as part of the "New Play Control!" series and in North America and Europe it was released together with the other two games of the Prime trilogy in the collector´s edition package Metroid Prime: Trilogy. Samus Aran detects a distress signal from the Space Pirates' Frigate Orpheon. She boards the frigate and finds it in disrepair, and largely devoid of life. Data found on computer terminals within the frigate suggest that it had been recently used to research the material Phazon, which the Space Pirates discovered on Tallon IV, the planet the Orpheon orbited. When Samus reaches the ship's Reactor Core, she discovers the most successful biological experiment of the Space Pirates, the Parasite Queen. Samus is forced to battle the creature. Its corpse falls onto the reactor, causing it to become critical. As Samus begins to evacuate the ship she is confronted by Ridley. Ridley causes an explosion that greatly damages Samus's Power Suit, reducing it to basic functionality. Samus quickly returns to her gunship. Ridley flies away to the planet and Samus pursues him. The frigate eventually falls to the planet. Samus discovers that Tallon IV was formerly inhabited by the Chozo. Thanks to the Lore the Chozo left on the ruins and temples of Tallon IV, Samus discovers that the planet had been struck by a meteor many years ago. The meteor, which would later be discovered to be a Leviathan, carried with it a strange substance, known to the Chozo as "The Great Poison". As the poisonous substance brought by the meteor spread over the planet, it caused great damage to the biosphere. At the time of Samus's arrival, it had already caused widespread mutations in the local organisms, and rendered some areas lifeless. Samus also discovers that the Space Pirates estimated that life in Tallon IV would perish in a span of 25 years. The various carvings scattered around the Chozo Ruins document the Chozo's struggle to destroy the substance emanating from the meteor and return the planet to its original state. The Chozo, who were themselves being eroded by the substance, were unsuccessful in their attempts to right the planet's ecosystem. Eventually, they resolved to seal the meteor and the Impact Crater from which the substance was emanating. The Chozo built a Temple over the crater to contain the Worm and to stop the spread of the substance on the planet. They also sealed its entrance and left twelve artifacts scattered all over the planet that served as keys to break the seal. After this the Chozo left the planet. After exploring the planet, Samus discovers that the Space Pirates have built a base on Tallon IV, and are experimenting with the "Great Poison" and its effects on Metroids and other local species. The pirates officially named the substance Phazon. 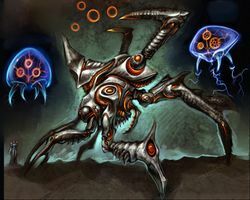 After hacking their database on the Phendrana Drifts facility, Samus discovers that the pirates had accidentally entered the Chozo temple from the underground and discovered a strange creature within. The creature killed the miners, but was later captured and subjected to study. It was discovered that the creature was genetically similar to a Metroid, though much more evolved. It was then named Metroid Prime by the pirates. It was also discovered that the creature was immune to the negative effects of Phazon, and that it had also a high appetite for the substance. The creature was kept in a stasis tank, but it eventually was able to escape. In the process it absorbed some of the pirate weaponry to its body and then returned to its lair in the Impact Crater. Samus also discovers the presence of several Chozo Ghosts in the ruins of the ancient civilization. The corruption that the Phazon brought was so immense that it even contaminated the ghosts of the Chozo. Some Pirates were killed by these ghosts, forcing the Pirates to prevent any access to the Chozo Ruins or Temples. The Space Pirates want to extract all of the planet's Phazon for use as an energy source and in continued biological experiments. They set up various research stations in different regions for the purpose of experimenting with Phazon. Finally, they begin excavations into the planet's surface so as to extract subterranean Phazon. This area became known as the Phazon Mines. It was also home to many biological experiments. Samus travels over the surface of the planet, searching out the artifacts and recovering the lost functionality of her Power Suit. Within the Space Pirates' Phazon Mines, Samus discovers that the Space Pirates had been conducting experiments involving subjecting embryos of their own species to Phazon. In a cavern in the lowest level of the mines, Samus discovers the most successful of these experiments, a huge Space Pirate called the Omega Pirate. The Omega Pirate attempts to kill Samus, but is unsuccessful. Despite its ability to heal itself by absorbing raw Phazon from the environment, Samus is able to defeat the Omega Pirate. However, it falls on top of her, deluging her in Phazon. The Phazon corrupts her Power Suit, turning it into the Phazon Suit, which has the ability to resist Phazon radiation. It also allows her to conduct Phazon from an external source to her arm cannon to be used as a weapon. Artwork of Samus engaging Metroid Prime. After collecting all twelve artifacts, Samus travels to the temple the Chozo built, the Artifact Temple hovering above the impact crater. There she uses the artifacts to unseal the crater. However, before she can enter the crater, Ridley, now rebuilt with Pirate Technology as Meta Ridley, arrives and damages the temple. Samus and Ridley begin to fight. After Samus deals enough damage to Ridley, the Chozo temple reacts, firing a laser directly at Ridley's chest. This knocks him into the abyss below. With Ridley defeated, Samus enters the impact crater with the help of some Chozo Ghosts that had not been contaminated by Phazon. Here she discovers Metroids and the presence of Orange Phazon, a substance that the scan visor identifies as 86% more mutagenic than normal Phazon. In a room deep within the impact crater, Samus finally faces the Worm, source of all Phazon in the planet, Metroid Prime. Due to its Phazon exposure, Metroid Prime has become more powerful than anything Samus had yet encountered on Tallon IV. It has the ability to attack with diverse weapons, and is able to shield itself from all of Samus's weapons. However, it is not capable of shielding from all weapons simultaneously, so Samus is able to damage it by switching weapons repeatedly. When Samus has depleted all of the creature's health, Metroid Prime falls to the lowest chamber of the Impact Crater. The creature then leaves its exoskeleton and reveals its essence and true form. In this form it becomes completely immune to all of Samus's weapons and also has the ability to cloak itself in the visible, infrared, and x-ray portions of the electromagnetic spectrum. The creature also releases Metroids to aid it in battle. This form generates pools of liquid Phazon as waste while attacking. By absorbing the Phazon and firing it out of her Arm Cannon, Samus is able to damage Metroid Prime. Critically damaged, Metroid Prime collapses into an unstable form. In this form, the creature grabs Samus. As she attempts to escape from its grip, the Phazon Suit is ripped from her body, leaving her to escape in her Gravity Suit. Metroid Prime loses all cohesion and explodes. Samus is able to escape the explosion. After calling her gunship, she jumps on to it while the temple begins to crumble and fall apart. Watching safely while standing above her ship, Samus takes off her helmet and stares sadly as the temple is destroyed. After this, Samus enters her ship and leaves Tallon IV. Back on the planet, the pool of Phazon that used to be Metroid Prime merges with the Phazon Suit. A hand begins to emerge out of the pool. On the back of the hand, an ominous eye begins to look around. Dark Samus is born. As in previous Metroid games, Prime takes place on an open-ended world connected by elevators. The player has to explore the world in search of various suit upgrades in order to access new areas. Many elements from previous Metroid games were kept such as backtracking, platforming and exploration. New to the series, the player is put in a first-person perspective inside Samus helmet. The HUD, also known as the Combat Visor offers basic information to the player, such as the health meter, number of Energy Tanks acquired, Missile count, caution meter, acquired beams and visors. Super Metroid introduced the series to the use of visors. Prime expands the concept to a new level. The Scan Visor for instance, has a crucial role in the game. With the use of this visor, Samus is able to scan the environment in search for clues and information. The visor also allows to hack into computer terminals, activate elevators and gives critical information, such as the weaknesses of the different enemies Samus encounters. The player also acquires two more visors, the Thermal Visor and the X-Ray Visor. The main focus of the game is exploration. The player must explore the world in search of twelve artifacts in order to access the Impact Crater, look for new suit upgrades and defeat bosses and mini-bosses, some which will reward the player with an upgrade. In order to offer some clues to the player, the game offers a hint system that gives a clue to the player of where to go next. The game also provides a 3D map of the world which allows the players to plot their course with ease. Many weapons and items from previous Metroid games return to Prime, such as the Morph Ball, Power Beam, Power Bombs, Grapple Beam and others. Some, such as the Screw Attack were not able to be added to the game due to time constraints. Though most of the game is played in a first-person perspective, when entering Morph Ball the perspective switches to a third-person camera. In this form Samus can access various areas that she would normally not be able to enter and has access to Bombs and Power Bombs. In some areas, while using Morph Ball, the perspective changes from 3D to 2D. The controls, despite the first-person point of view, do not use the dual-analog control scheme found on other shooters. Instead the player controls Samus fully with the left stick and is able to aim manually by pressing the R button and then moving the camera with the left stick, though in this form, the player cannot move. To make combat possible, Retro Studios implemented a targeting system similar to the one found in the Legend of Zelda series. The player presses the L button to target opponents, and can move around the enemy by pressing the jump button and moving the left stick to the wanted direction. The player is able to switch visors and beams by using the C-stick and the D-pad. The game offers different kinds of endings, three in total, depending on the number of items the player collects. Obtaining 100% completion in tasks such as scanning also unlocks an art gallery bonus accessible via the main menu. As in previous Metroid games, sequence breaking is also possible in the game. During the entire Nintendo 64 period, many fans awaited for a new Metroid game, but no Metroid game was released during the Nintendo 64 era. Shigeru Miyamoto stated that Nintendo wasn't able to "come out with any concrete ideas". Retro Studios was created in 1998, by an alliance between Nintendo and the former Iguana Entertainment founder Jeff Spangenberg. Retro established its offices in Austin, Texas in 1999. That year, the studio received five game ideas for the Nintendo GameCube. Later on, the five game ideas were all left in favor of one game: the new Metroid title. Nintendo members, such as Shigeru Miyamoto, Kensuke Tanabe and Kenji Miki, as well as Metroid designer Yoshio Sakamoto, communicated with the Texas-based studio through emails, monthly phone conferences and personal gatherings. The game was originally envisioned as having third-person perspective gameplay, but this was changed to a first-person perspective after Miyamoto intervened, overhauling nearly everything already in development. Miyamoto said that the new perspective would benefit the visor. The game was directed by Mark Pacini. Pacini states that they tried to make the game so that the only difficult parts would be boss battles, so players would not be "afraid to explore", because "the challenge of the game was finding your way around". In 2000, three games were canceled to establish focus on Prime, and in 2001, the fourth other project (an RPG called Raven Blade) was canceled, so that Prime would be the only game in development. The first glimpse of the game was seen on the ten second video at SpaceWorld 2000, where nitpicks of other games such as Mario and Zelda were also shown. But it wasn’t until E3 2001 that the game was officially announced. It received mixed reactions from fans and critics, many of them concerned about the change from a 2D side-scrolling point of view to a first-person perspective. Music in Prime was the only part of the game that was completely done in Japan. Composer Kenji Yamamoto returned to compose the music for the game, assisted by Kouichi Kyuma. Some of the game’s soundtrack were remixes from previous titles. Yamamoto said that the reason to do so was that he wanted, "to satisfy old Metroid fans. It’s like a present for them." Music such as the one found in the Tallon Overworld is a remix of the Brinstar theme found in the original Metroid game, the music found in the Magmoor Caverns is a remix of the Lower Norfair region in Super Metroid. Tommy Tallarico Studios aided in developing the sound effects. Though the game kept many elements from previous games, some of them were not able to be included due to time constraints. Kraid, a boss from the original Metroid game and Super Metroid was meant to have an appearance. Designer Gene Kohler modeled and skinned him, but he was not included at the end. The Screw Attack and Speed Booster were also meant to be featured in the game, but were also not included. The Screw Attack made an appearance in later installments. When Metroid Prime was being localized for a European market, alterations were made to the Scan Visor logs and other in-game text, substantially altering the plotline. The American Metroid Prime: Trilogy version of Prime uses a third set of logs that more closely adheres to the European plot than the original plot. Retro Studios, the creators of the Prime series, has previously announced that the changes made to the European version of Metroid Prime are unauthorized and incorrect. However, the subsequent release of Trilogy by Retro Studios calls into question whether or not that decision still stands. Many review sites were originally skeptical of the game, believing that it would fail because it deviated too far from the original Metroid formula. However, the game was met with critical acclaim, ensuring that the long dormant Metroid franchise would have new life breathed into it. This page was last edited on 3 April 2019, at 14:23. This page has been accessed 126,506 times.